Question: Suppose points A and B are all on the circle C with center O. Prove that the perpendicular bisector of segment AB contains O. Here is how my proof goes. I used proof by contradiction. SO I assumed to the contrary that the perpendicular bisector does not pass through point O. WOLOG assume it passes through some interior point on segment OA. By definition of perpendicular bisector we know that AM=MB. We know that AO is congruent to BO since both are radii. It follows that triangle AOB is isoceles. We construction another line OM. It follows that triangle OMA is congruent to OMB by SAS congruence. It follows that angle AMO ≅ angle OMB by CPCTC. But AB is a line segment so we know that angle AMO and angle OMB are supplementary. But since they are congruent that means angles AMO and OMB are 90*. Thus a contradiction which means the perpendicular bisector does pass through O. A direct proof is less complicated. Let point $M$ be the bisector of line segment $AB$. Join $O$ to $A$, $B$, and $M$. Note that $OA=OB$. So triangles $OMA$ and $OMB$ are congruent (side, side, side). It follows that $\angle OMA=\angle OMB$. 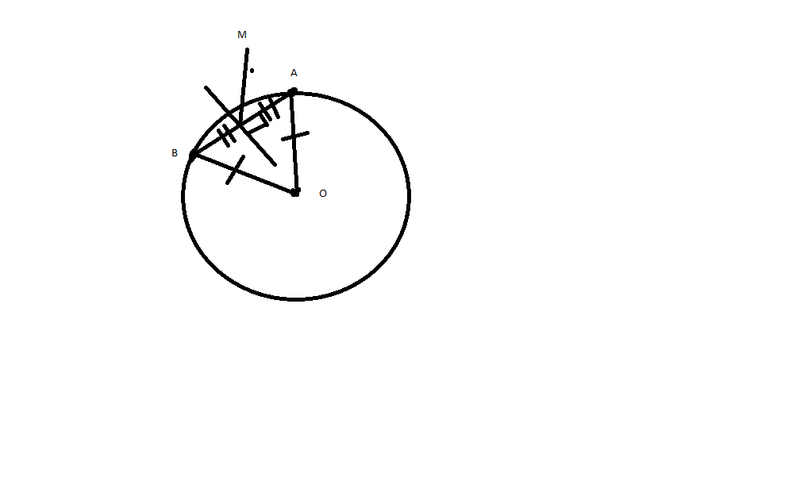 Thus each is a right angle, and therefore $O$ lies on the perpendicular bisector of line segment $AB$. There's another way. Draw a perpendicular from the center of circle. Then prove than from Pythagoras theorem. $OM^2+AM^2=r^2$, Here $r$ is the radius. Lengths can't be negative. Therefore, $AM=BM$. Thus proved. Why must triangle inscribed in circle have a right angle? What is sufficient to prove Kiselev's Geometry #82?